Wells prefers to frame his narrative through the characters, as they play different levels of one company, plagued with the backlash of a falling stock price, lost business and too many “human units” for the company to “support.” It’s time to downsize. 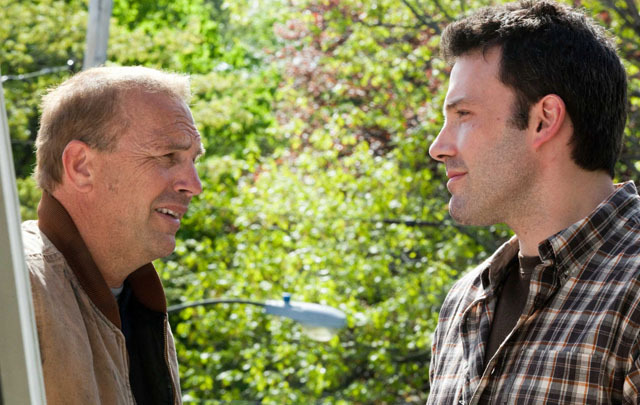 Ben Affleck is Bobby, a happy-go-lucky director of sales for a Boston shipping company. On a day when the news in ominous, the chirpy morning shows having to mournfully report on the potential economic collapse in America 2007, he is simply going to work. When he arrives, he is called on the carpet. His position has been eliminated. Behind Bobby’s firing is the power base of the company, the founders Gene (Tommy Lee Jones) and CEO James (Craig T. Nelson). Gene is more pragmatic regarding the circumstance, a plain speaker who tells it like it is, which freaks out the CEO, who needs the financial press to think that all is well. The major purging of human capital is the chief factor in keeping the stock price steady, and the boardroom is willing to keep feeding the numeric illusion. Meanwhile Bobby is thrust into a world that he has never experienced. Trying to keep the payments up on his McMansion and upper middle class lifestyle, with a meager severance and unemployment benefits, starts to wear on his personal life. His wife Maggie (Rosemarie DeWitt) is extremely supportive, but the breadwinner is distant from both her and their son as it becomes obvious that there jobs are not as plentiful as before. Bobby even haughtily rejects an offer to work construction for his brother-in-law Jack (Kevin Costner). The company continue to purge. Sally (Maria Bello) is the cold hatchet woman, and the affair she is having with pragmatic Gene is turning into something deeper. The axe falls hard on one of the oldest and twitchiest employees, Phil (Chris Cooper), and his reaction has dangerous ramifications. The CEO is celebrating the uptick of the stock price by preparing a new, luxurious downtown headquarters. When Gene suggests that this might not be the right thing to do, his job suddenly becomes suspect. The company that had built in the American Dream for so many people has proved its ability to destroy it as well.